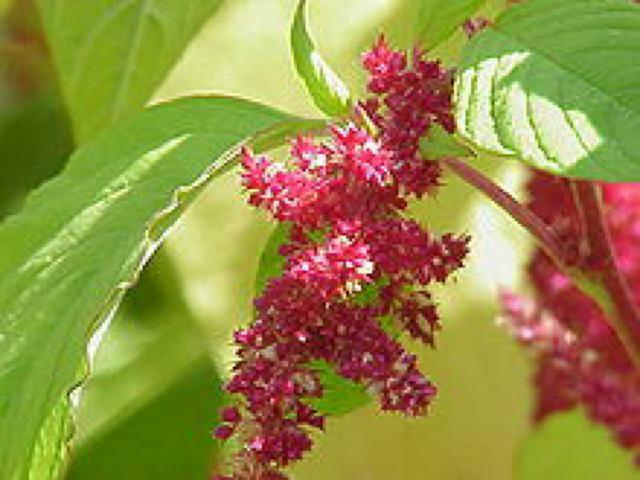 Description: Amaranth is arguably the most enigmatic and magical plant in the world. I came across it quite accidentally while researching Quinoa. Its grains too are tiny and like quinoa it has some amazing health properties. I had never encountered the grain before but then discovered that I knew its leaf all my life as Molla Keerai (Tamil) and Dhantin Soppu (Kannada), a form of spinach popular in South India with characteristic red and green leaves. Amaranth is probably also the most versatile plant in its edibility, whose stems, leaves & seeds are all edible. The grain is amazingly healthful and to top it all, its flowers are stunningly beautiful! Its grains are very familiar in western India (as Rajgira) but in China (Hinn choy), Thailand and in south India it is a form of spinach. 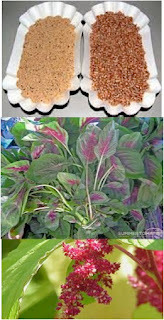 Amaranth can also be cooked as a cereal, ground into flour, popped like corn, sprouted, or toasted. The seeds can be cooked with other whole grains, added to stir-fry, or to soups and stews as a thickening agent. Mexican “Alegria” is a confection in which Amaranth seeds are popped and mixed with sugar syrup. Another Mexcian drink is the Atole made with milled roasted Amaranth grain. Peruvians make an Andean beer Chicha; Nepal and parts of North India make Satto, a kind of porridge. It is just incredible, that one set of people in the world know it as a form of spinach, another know it as a miracle grain, yet others eat its stalk and another makes beer while some only now it as an ornamental plant blissfully unaware of its edible nature! Originating in the Americas and Europe, Amaranth (from Greek for “never-fading flower”) has been cultivated for more than 8,000 years, dating back at least to the Mayan civilization of South and Central America. The largest area ever grown was during the height of the Aztec civilization in Mexico during the 1400s. After the arrival of the Spanish conquistadors in Mexico in the early 1500s, Amaranth almost disappeared in the Americas as a crop until research began on it in the US in the 1970s. The largest producers today are USA, South America, India, China and Russia. The heightened awareness of the crop’s nutritive values and its versatility is likely to trigger a major resurgence for Amaranth globally. Kitchen Pharmacy: The amaranth seed is high in protein and contains essential amino acids not commonly found in other grains. It is high in fiber and contains calcium, iron, potassium, phosphorus, and vitamins A and C. The fiber and iron content of amaranth is significantly higher than that of wheat. Using amaranth in combination with corn or brown rice results in a complete protein similar to that found in fish, red meat, or poultry. Amaranth consists of 6-10 percent oil which is predominantly unsaturated fat and is high in linoleic acids(4). It is the only grain documented to contain Vitamin C.
Amaranth oil "could be of significant benefit for patients with CVD" (cardio vascular disease(4). "The combination of amaranth and maize flour (50:50) nearly reaches the perfect score of 100 on the nutritionist’s scale and also the combination of amaranth and wheat flour increases the nutritional value of baked products"(2) (National Academy of Sciences 1984; Saunders, Becker 1984; Bressani 1989; Joshi, Rana 1991; SeguraNieto et al 1994; Grobelnik Mlakar et al 2009). The leaves are chopped and stir-fried with onion chilies and garlic like Methi leaves. In Maharashtra the leaves are know as Rajgira. 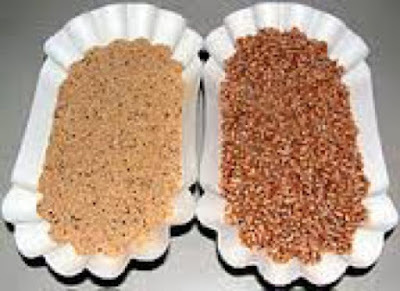 Seeds are cooked like rice and served with a sauce made out of peanuts when fasting.